The Beauceron is a rabbit and herding dog breed falling into the working dog category whose origins lie in the plains of Central France. 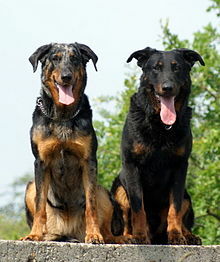 The Beauceron is also known as Berger de Beauce (sheepdog from Beauce) or Bas Rouge (red-stockings). A French herding breed known for centuries in western Europe, the Beauceron is noted as one of the breeds used to create the Doberman Pinscher. Although quite different in appearance, the Beauceron and the long-haired sheep dog, the Briard, stem from similar ancestral stock, sharing the trait of double dewclaws on the hind legs. Both were used to herd sheep and cattle. Like the Beauceron, the Briard is found throughout northern France, and despite implications from its name, also did not come exclusively from the Brie region. Wikinews has related news: Four new breeds in the Westminster Kennel Club Dog Show. A versatile breed, the Bas Rouge is used to both guard and herd sheep and cattle. It was once very useful against wolves, now long gone from central France. The breed served in both world wars as messenger dog, supply transport dog, land mine detection dog, search dog, police dog and rescue dog. This breed stands 61 to 70 cm (24 to 27.5 inches) in height and weighs 30 to 45 kg (66 to 100 pounds). The Beauceron has a hard outer coat and a woolly undercoat that grows thick in cold weather, especially if the dog sleeps outdoors. Its standard colouring is black and tan (the latter colour referred to in French as rouge ecureuil, squirrel-red) or grey, black and tan called harlequin. Other colours, such as the once prevalent tawny, grey or grey/black, are now banned by the breed standard. The merle coats should have more black than gray with no white. 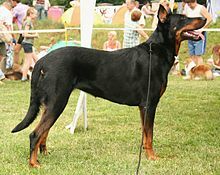 In the black and tan dogs the tan markings appear in two dots above the eyes, on the sides of the muzzle, fading off to the cheeks, but do not reach the underside of the ears. Also on the throat, under the tail and on the legs and the chest. Tan markings on the chest should appear as two spots but a chest plate is acceptable. Double dewclaws are a characteristic of the Beauceron. Although most breeds may or may not have dewclaws (many owners of other breeds remove dewclaws, especially if the dog is used for field and hunting), an important feature of the Beauceron is the double dewclaw. In order to be shown, a beauceron must have double dewclaws that form well-separated "thumbs" with nails on each rear leg; anything less will result in disqualification from dog shows. Ear cropping is no longer allowed in Europe. The Beauceron is known in France as a guard dog, a helper around the farm (herding sheep or cattle), and/or a ring sport dog (primarily protection training). This athletic, healthy and long-lived breed has been bred to be intelligent, calm, gentle, and fearless. Adults are typically suspicious of strangers and are excellent natural guard dogs. On the other hand, they typically take their cue from their handlers when it comes to greeting strangers, and are neither sharp nor shy. They do best when raised within the family but they can sleep outside, the better to act as guards (their weatherproof coats make them ideal kennel users even in the coldest winters). They are eager learners and can be trained to a high level. However, their physical and mental development is slow relative to other similar breeds (e.g. German and other large shepherds): they are not mentally or physically mature until the age of about three years, so their training should not be rushed. Several five- or ten-minute play-training exercises per day in the early years can achieve better results than long or rigorous training sessions. Beaucerons can compete in dog agility trials, obedience, showmanship, flyball, tracking, and herding events. Herding instincts and trainability can be measured at noncompetitive herding tests. Beaucerons exhibiting basic herding instincts can be trained to compete in herding trials. They are excellent search and rescue dogs. There is a Beauceron named Bosco in the film Marmaduke. A dog of the same breed is also in the film Hotel for Dogs. His name is Henry. A pack of hunting Beaucerons appeared in the 1988 movie The Bear. A Beauceron was also seen in the film The Wild Child. Two Beauce Shepherds appear in the James Bond movie Moonraker. There was a Beauceron used extensively in the search and rescue efforts in the terrorist attacks on the World Trade Center in New York City on September 11, 2001. There was a Beauceron in a brief scene in the Martin Scorsese directed film Gangs of New York. ^ "American Beauceron Club - The Beauceron Standard". Beauce.org. Retrieved 21 December 2014. ^ Pierre Morjarret. "Standard du Berger de Beauce". Amisdubeauceron.org. Retrieved 21 December 2014. ^ "Beauceron: Dog Breed Selector: Animal Planet". Animal Planet. Retrieved 3 November 2011. ^ "Beauceron: Weird Facts/Did You Know?". Terrificpets.com. Archived from the original on 21 December 2014. Retrieved 21 December 2014. 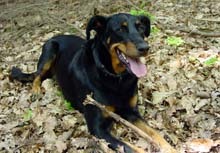 Wikimedia Commons has media related to Beauceron.